We've had a couple of cooler days here in Philly and with football season in full swing, I'm finally willing to turn a little bit of my attention to the season that's now upon us: fall. As I've said before around here, I heart summer like, big time, so it's hard for me to let go :). Once fall arrives, I do love it too - it's a big adjustment for me, haha. Anyway, I'm not a huge seasonal decorator, but I do like to add in some season-appropriate elements around the house when that change comes. Seasonal decorating doesn't have to be super involved, nor does it have to be expensive. A few budget-friendly elements here and there are all it takes. When it comes to fall decorating specifically, your house doesn't have to look like you planted an orange pumpkin patch all over it (unless that's your thing, of course) and it doesn't have to scream halloween either. There are lots of little ways you can make things feel more like fall in your home and I've got a few for you to consider today. Feel free to add your ideas to this list in the comments section! First up, cozy things up with texture and natural elements. 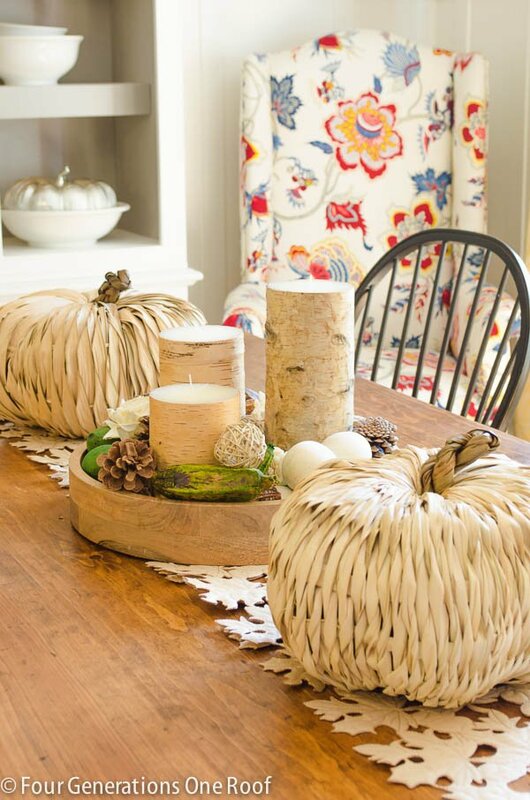 I love these birch bark-wrapped candles and woven pumpkins that Four Generations One Roof added to her dining room table. 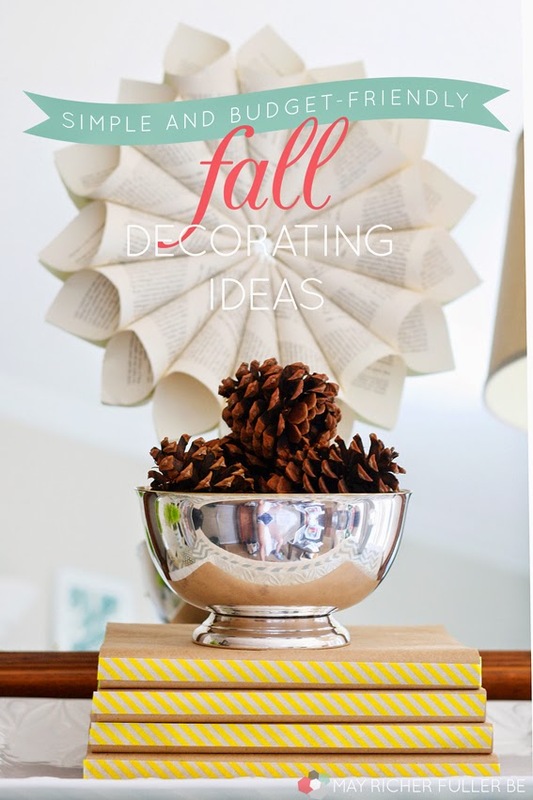 It doesn't get any simpler than throwing some pinecones, tree branches and white pumpkins into a tall, clear vase and putting it on a side table, buffet or entryway console. No fancy styling tips needed! 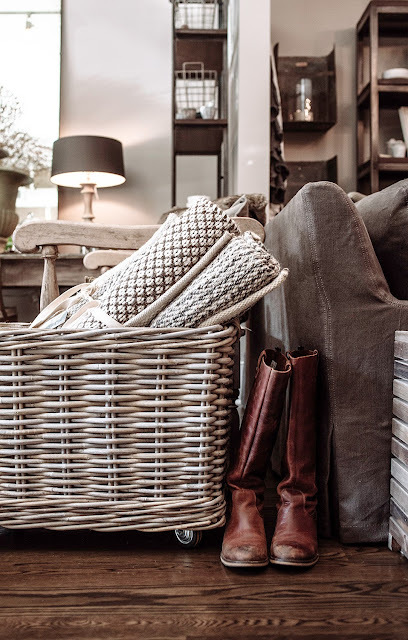 Baskets are something you probably already have and fit in beautifully with fall decor. Texture like that just feels like fall, don'tcha think? Take this photo for example. It doesn't scream fall, but can't you see it in a room with a fireplace and a warm cup of coffee? Cozy. 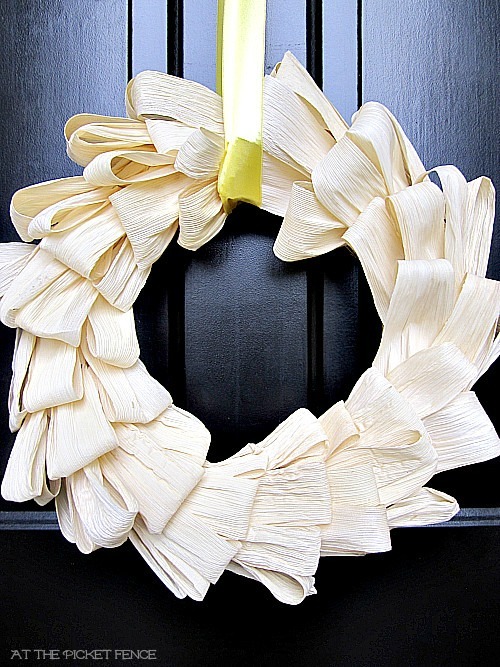 Make a fall wreath for your front door a la this corn husk wreath from At the Picket Fence. Or how about this dyed coffee filter one? Haul out those blankets from the deep, dark corners of your closet and put them on display. 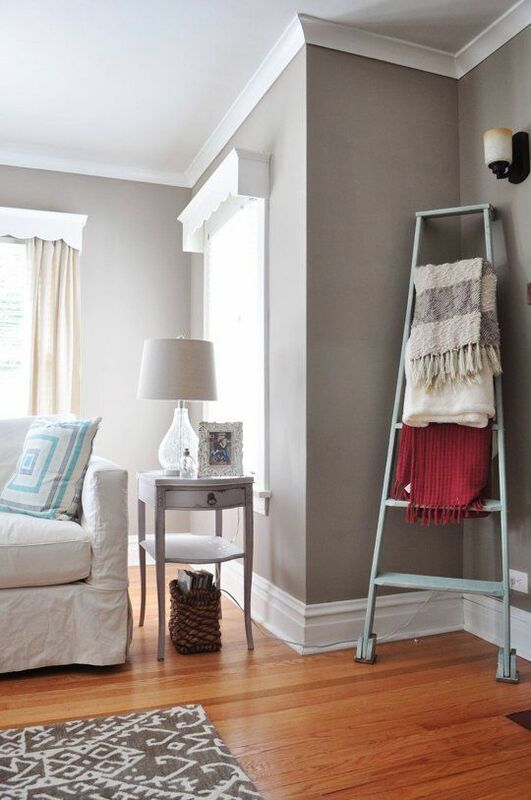 DIY yourself a blanket ladder for them, or find one at a flea market or thrift store like this one below. I've seen these ladders all over the place lately! Or you can keep it simple and just put them in one of those baskets like the photos above :). Add in some new art around the house. You can make this chalkboard poster art for $4! Talk about cheap thrills. Another easy idea? Sketch something fall-related on a piece of stained wood. It's simple, rustic, and probably takes about 30 minutes of work (unless you're indecisive like me and can't decide what sketch). If you've got a mantle, decorate it! 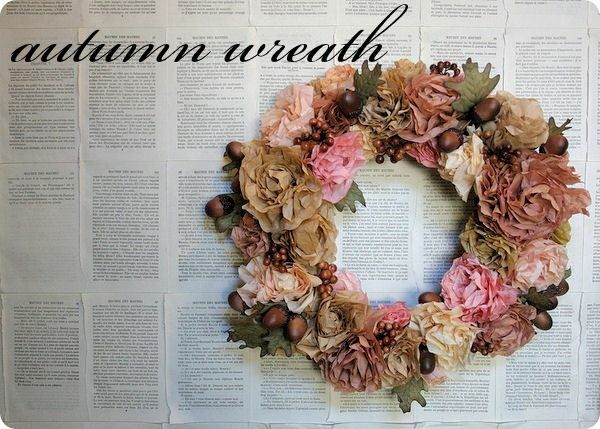 Play around with some different fall-related accessories like candles, tree branches, pumpkins, gourds and wreaths. Shop your house, and don't feel like you have to only use things you'd see in the fall section at Target (though, man, they've got some good stuff right now). 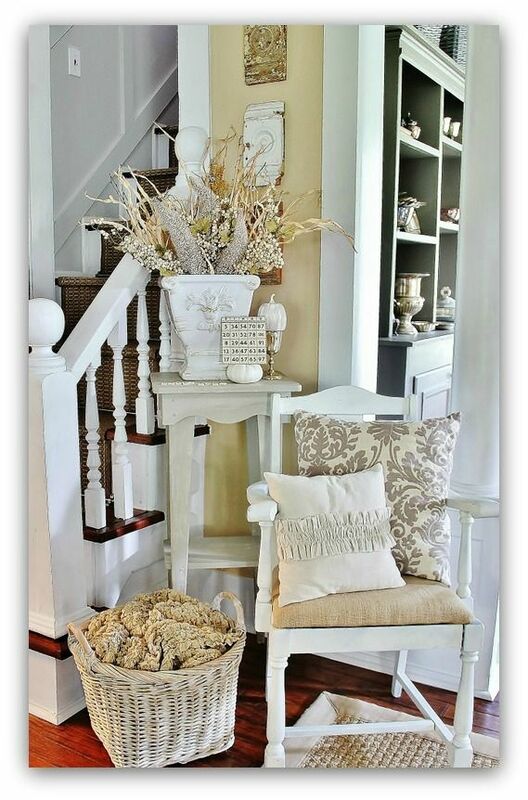 I'll bet you could find plenty of things in your house and not spend a dime on "fall decor." ...and I'd better stop with that. I could go on all day! 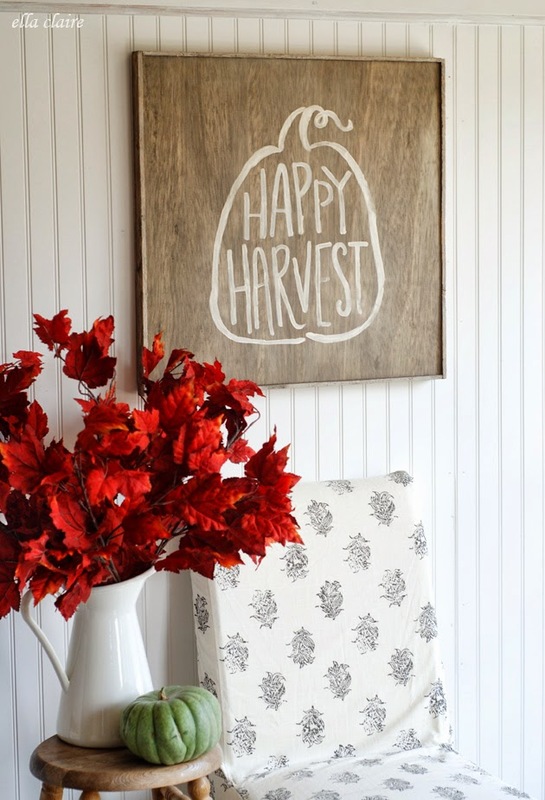 What are you doing to decorate for fall?